I read somewhere that there are 7 million colors distinguishable to the human eye. Sometimes it feels like the paint companies are set upon offering you every single one of them as an option for your home improvement project. Don’t get me wrong; I’m all for choice and the more choice the better. However, it can get a little befuddling trying to figure out which ones are going to blend well together for your new color scheme. When you’re confronted with the challenge of how to choose a paint color, color wheel schemes can be a time and design faux pas saver. We hope these color wheel interior design tips help you find the scheme to meet your needs. 1. You’re perhaps familiar with the old saw that opposites attract? Well that turns out to be true with color wheels. Pairings can be found at opposite ends from each other on a paint color wheel. When such opposites are matched up, they bring out the best in each other. Matching them make both colors look cleaner and brighter than if either were mixed with, say, a neutral gray or a different shade of the same hue. 2, Color wheel basics are that there are three primary colors: red, blue and yellow. These are then combined to make the three secondary colors: orange, green, and purple. Finally, the remaining six colors on the wheel are known as tertiary colors and are mixes of the secondary colors, including such hues as red-orange and blue-green. Then you get into your shades. 3. 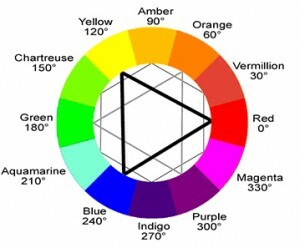 Familiarize yourself with the color wheel so that you can mix and match cool colors with a warm ones. This provides for a naturally balanced room. 4. Red and Green: Remember to figure in the finish of any woodwork in the room. In a rustic Colonial-style kitchen, for instance, green hues brushed onto walls and lower cabinets may complement the red tones of a mahogany beadboard or cabinets. 5. Red-Orange and Blue-Green: The colors you choose don’t have to have equal prominence in the room to work. One may be the main color while the other serves as an accent. Another possibility is to bring small colored accessories into an already painted room to see how you feel about the pairing. You may find, for instance, that energetically bright orange-red towels and glass pop against the cool, blue-green of bathroom walls without overwhelming the soothing hue. 6. Orange and Blue: Keep your furniture in mind when considering a new paint color. A cool blue milk paint wall will accentuates the bright burst of orange on a blanket chest placed in front of it. 7. Yellow-Orange and Blue-Violet: Bright colors will breathe new life into traditional woodwork and they work especially well in casual living areas. Glossy violet-blue pantry doors in a mudroom will pop new life into the room when placed against the yellow-orange of an adjacent wall. When you’re working with more saturated hues, remember that the colors will often appear more intense on the walls than they do on the strip. 8. Yellow and Violet: Sometimes people feel a bit timid about jumping in with both feet and suddenly splashing a couple of cans of color onto the walls. That’s understandable. If that’s you, though, consider using two complementary colors as accents in the same room. For example, in a 1950s kitchen, a yellow window casing and violet countertop will show nicely against a neutral beadboard and white cabinets. 9. Yellow-Green and Red-Violet: Finally, be sure that the intensities of the tones you use are well balanced. A pale yellow-green trim in a kitchen meets its match in the form of a subdued reddish-violet paint on the walls. Knowing how to choose a paint color can be a challenge. An informed use of color wheel schemes can be a big help. We hope these color wheel interior design tips help you find the color scheme that suits your home.